The singer says she had "an amazing time" Saturday with her Sanford H. Calhoun High School classmates. 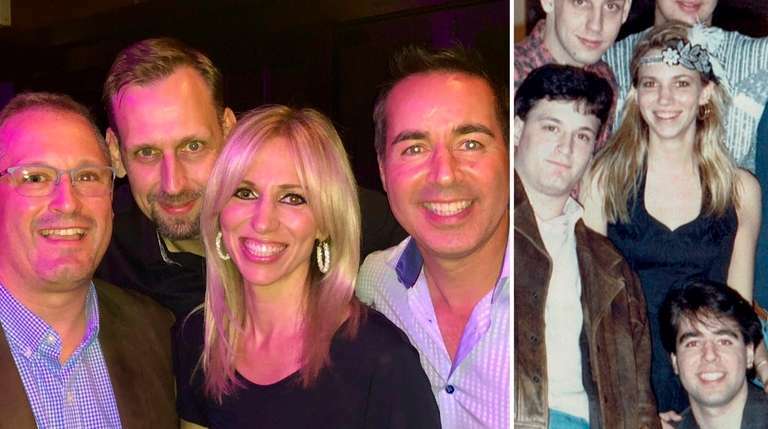 Merrick-raised music star Debbie Gibson was back on Long Island over the weekend celebrating her 30th high school reunion. "What an amazing time at my 30 year reunion, Calhoun H.S." the pop star, 48, tweeted Saturday, the night of the event at Kasey's Kitchen and Cocktails in Rockville Centre. "Here I am with some great friends then and now!" she wrote, with before-and-after photos of herself and classmates Paul Signorelli, Tom Ratas and Mike Provenz. Provenz also appeared with two different classmates in a Facebook photo Gibson posted Sunday. "Last night with friends Ron Luparello, Peter Ragone and Mike Provenz at my 30th high school reunion! Check out my Story for more pics with friends from high school. A lotta love and support in the room. TY [Thank you] ." In the since-expired, one-minute Instagram Stories video, Gibson, who now lives in Las Vegas, poses happily in a series of still photos with many individual classmates. "Amazing to catch up with friends from high school last night," she wrote in graphical text. "A lotta love and support in the room." "I did not know she was coming," reunion coordinator Wendy Gargiulo told Newsday. "She was a last-minute show," with no special security measures asked for or taken. "Our classmates treat Debbie the way we would treat any other classmate; she is embraced and treated with kindness and respect. She is a part of all our memories." At least 100 people attended, Gargiulo said. Despite her platinum-record success while still in high school, Gibson — who had with five top-10 hits in close succession from 1987 to 1989 — attended graduation at Sanford H. Calhoun High School in Merrick. "I did,” the Long Island Music Hall of Famer told Newsday in August. "But we had to sign an insurance waiver saying if anyone got hurt that I was responsible." She added jocularly, "I did not torture myself all through high school to not graduate with my class!" and said with a laugh, "No injuries were sustained!" "Great pics. We haven't aged a bit," Provenz joked on Gibson's Twitter page.